Updated February 9, 2011 to include ground source heat pump HVAC system and equipment plug loads. Sometimes it can be difficult for Architects to participate in the design of low energy buildings. During the integrated design process, Architects can speak qualitatively about their ideas but cannot present quantitative data to support their arguments. Therefore, it is easy for them to abdicate leadership of the design to mechanical engineers, who are armed with a myriad of tools to support their ideas. With the introduction of EnergyPlus (E+) and OpenStudio, it is possible for Architects to create Energy Models to test their ideas and build data to support their arguments. EnergyPlus (E+)1 is an energy simulation software developed by the Department of Energy to help design professinals calculate the energy usage of buildings. OpenStudio2 is a free plugin for Google Sketchup 3D modeling software that allows designers to build building geometry for EnergyPlus. DiaLux3 is a free professional lighting planning software can be used to validate daylight illumination levels and validate assumptions made during artificial lighting energy calculations. This article will illustrate one example of how an architect can use EnergyPlus to design a net-zero energy building on paper. The study will begin with energy saving strategies within the Architect's control: layout, orientation, solar shading, building materials, glazing, and daylighting. After minimizing energy usage, this study will use E+ to calculate the area of photovoltaic panels required to reach net-zero energy. Building configuration and orientation are strategies that architects historically have employed to increase the energy efficiency of buildings. Energyplus (E+) allows architects to establish and compare the baseline energy usage of different building configurations using the same building material and construction. 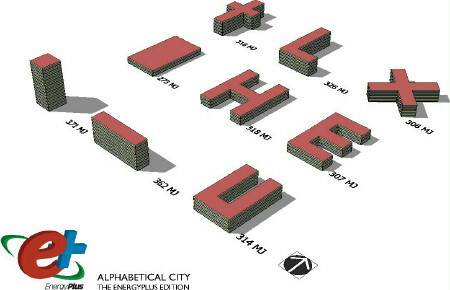 Figure A shows nine building layouts inspired by Steven Holl's pamphlet Alphabetical City4. All the buildings were designed with the same envelope construction: metal panel walls, green tinted insulated windows, and single-ply roof with R-15 insulation. The selected site for this study was San Francisco, CA. 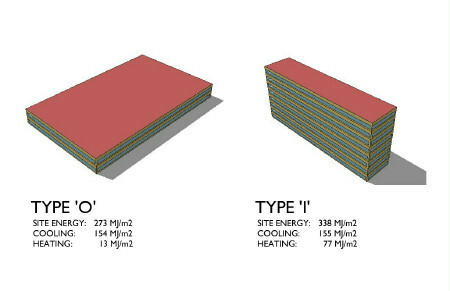 With no sustainable strategy employed, the most energy efficient layout is type 'O' (BO), the large floor plate rectangular building, with an annual energy performance of 273 MJ/m2 (mega joules per meters squared). The small perimeter to floor area ratio makes it an efficient building to heat and cool with a traditional HVAC system. Conversely, type '.' (square tower) with a high perimeter to floor ratio has the worst annual energy performance at 371 Mega Joules per square meter (MJ/m2). With its limited access to natural light, type 'O' is not an ideal building type to use with many sustainable strategies. 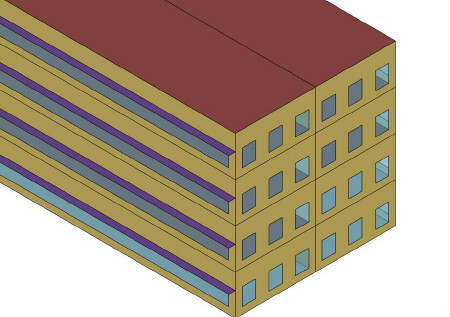 Although the type 'I' bar building (BI) does not appear to be energy efficient in this initial study, it does possess qualities that enable it to benefit from sustainable strategies such as access to natural light and a large South elevation that can employ solar shading to control heat gain. Therefore, this study will focus on the bar building as the baseline building type to compare the benefits of various sustainable strategies. Solar orientation has a substantial impact on energy usage for directional buildings. This is most dramatic when applied to the type 'I' Bar Building (BI). When the North-South facing bar building (BI) was rotated 90 deg. to face East-West (BI-NS), the overall energy usage increased by 11.5%. Although Figure B illustrates the impact of layout and orientation on energy usage, layout and orientation are just the starting points of an energy efficient design, elements used to determine the baseline of any building typology. In warm and temperate climates, shading is an effective strategy for reducing energy usage. EnergyPlus can help a designer calculate the most effective sunshade configuration. This study uses as its baseline model a building with standard office glazing: ribbon windows with 30" sill height and 9' head height all around the building. Exterior windows used in the model are double glazed insulated windows with 6mm green tinted glass (SHGC= .049) and 13mm argon filled air space. Table C compares the E+ results of three shading strategies to the baseline building (BI). Model (C1) utilizes only 30" deep sunshades along its South elevation. Shading the South elevation improves the building's energy efficiency by 13%. Model (C2) and (C3) illustrate two different strategies for shading the East and West elevations. Horizontal sun shades are only partially effective when used on the East & West elevations. The low sun angles of the morning and late afternoon sun make it all but impossible for horizontal shading devices to block out heat gain and glare. Model (C2) employs 30" deep sunshades on the East & West elevations and model (C3) uses no sunshades but reduces the size of East & West windows by 50%. In this study, reducing East & West window size (C3) outperforms sunshades. Overall, this study shows that an effective shading strategy can improve energy performance by 15%. Using daylight in lieu of artificial lighting can save energy two ways: from reduced electrical energy used by artificial lighting and from reduced heat gain from light fixtures. EnergyPlus can help a designer calculate the energy savings by reducing lighting energy. However, the lighting layout needs to be validated by a daylight simulation program to make sure that the illuminance level of program activities are maintained. For office uses, useful daylight is between 250 lux and 500 lux. Electric lights can be switched off when daylighting can provide 250 lux to a particular zone. Glare, another component of daylight, should be avoided. The discomfort of glare is usually solved by lowering shades. However, shade cloths and blinds can greatly reduce the effectiveness of daylight, therefore negating the benefits of having daylighting. Table D shows the results of reducing lighting loads on the energy usage in our energy model. Model (D2) shows that reducing artificial usage by 50% can produce a 25% savings in overall energy usage. Roughly stated, model (D2) assumes that the building design can produce enough daylight that will allow artificial lights to be switched off an average of 50% of business hours (9am-5pm) all year. This assumption can be validated using Sketchup and Dialux (a lighting design software). The designer can use Sketchup to optimize the height of the clerestory windows, the depth of the sunshades, and depth of the light shelf to allow the maximum amount of daylight into the building while minimizing direct sunlight or glare. Using criteria established in Sketchup, the designer can model the room design in Dialux to validate the daylight illuminance at various times of the year. Figure D shows a false color image of the lighting levels in the bar building on March 21st at noon. Daylight modeling can be used to establish the areas of the floor plate that can achieve useful daylight levels at various times of the year and various times of the day. The daylighting study for model (D2) confirms that useful daylight (250 lux to 500 lux) can be achieved on most of the floor area from 9am to 3pm for most of the year. We can safely assume that we can use daylighting strategy to reduce lighting consumption by 50% and therefore achieve 25% savings in overall energy consumption as modeled in EnergyPlus. The building envelope controls how much heat enters or escapes from buildings. EnergyPlus has advanced tools to customize materials and construction of exterior walls and windows. Using these tools, the designer can test sustainable strategies such as adding insulation, introducing thermal mass at the perimeter, upgrading to low-e glass, and employing double glazing facades. The success of these strategies depends greatly on climate and location. For example, over-insulating and double facades are most successful in Northern climates. Perimeter thermal mass is most effective in year-round warm climates. Temperate climates, such as San Francisco, CA, requires moderate insulation but benefits most from improved glazing. 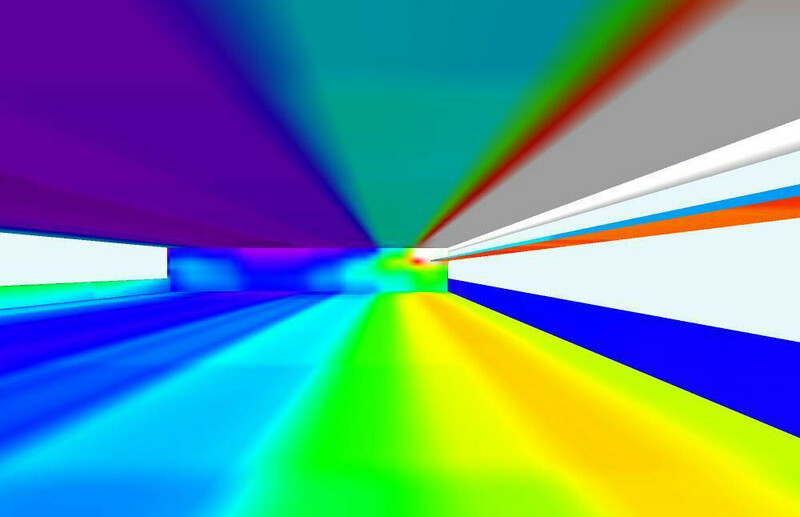 In this study (San Francisco, CA), glazing with spectrally selective glass (model E1) produces the best results in the energy simulation. The spectrally selective coating allows large amounts of visible light to pass through while filtering out most of the light in the infrared spectrum. 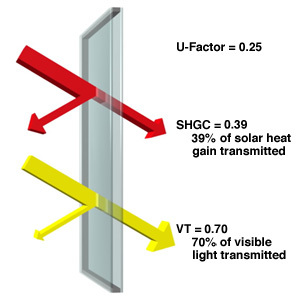 As a result, this special low-e glass allow daylight to enter the building while controlling heat gain. The use of low-e spectrally selective glazing improves the energy efficiency of the building in by 13%. San Francisco's temperate climate doesn't benefit from over-insulaton. Model (E3) with R-30 wall insulation and R-60 roof insulation actually uses more energy than the baseline model. Internal heat loads such as artificial lighting and people is trapped inside building by heavy insulation. Model (E4) increases thermal mass by adding 4" thick concrete substrate around the perimeter and replacing concrete filled metal deck floors with 8" concrete slabs. Thermal mass (E4) does not improve the energy efficiency of the building over baseline. However, model (E4) requires almost no heating (.4 MJ/m2). Increasing thermal mass can be a strategy to save money by saving the cost of having a heating system. The sections above describe the impact of each sustainable strategy on energy usage. How much energy can be saved when all all strategies are employed together? Study F shows the cumulative impact of adding solar shading, reducing artificial lighting, and adding low-e spectrally selective glass. With all strategies employed, the potential energy savings is 34%. A building's mechanical system has the single greatest impact on its energy usage. After employing all architectural strategies to improve the energy efficiency of a building, it is time to investigate energy savings through efficient HVAC systems. Sustainable strategies usually take advantage of natural resources to save energy. In the San Francisco Bay Area (California Climate Zone #3), the ground temperature provides a nearly free resource for cooling buildings. Six feet below the ground, the soil temperature varies between 51° F in the Winter to 60° F in the summer. A ground source heat pump can use the difference between the air and ground temperature to provide heating and cooling. Model (H4) depicts a building with a VAV system connected to a vertical ground source heat pump. The ground source heat pump reduces both cooling load in the Summer and heating load in the Winter. This system results in a 16% energy savings over the standard VAV system. For mechanical systems, pushing water through the building requires less energy than pushing air. More efficiency can be achieved by switching to a hydronic system. Model (H6) shows the same building as (H4) with radiant slab conditioning system with only a small air loop with heat exchanger to provide fresh air. Heating and cooling is also assisted by the use of a ground source heat pump. This system results in a 21% savings over the standard VAV system. Once the designer has reduced the energy usage of a building, Energyplus can help him/her calculate the area of photovoltaic panels required to generate enough energy for a net-zero building. EnergyPlus Generator with PV example file provides three different types of PV panels: simple, equivalent one-diode, and Sandia (values provided by Sandia Labs). This study uses a simple PV panel with 12% cell efficiency, fixed conversion efficiency, and active cells on 50% surface area. In real life, the panel manufacturer will provide data for photovotaic performance. 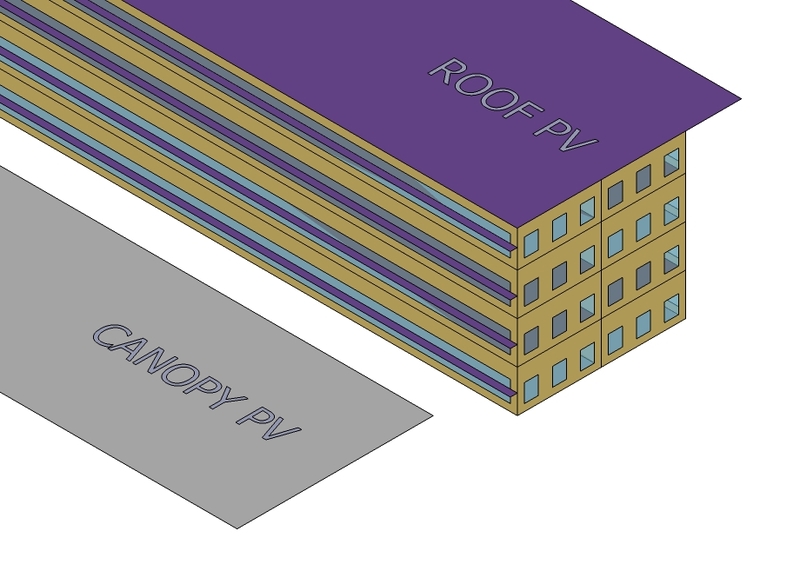 Model (J8) shows that Net-Zero Energy usage can be achieved with the use of photovoltaic panels mounted on top of the roof and over part of the parking. The ratio of PV area to floor area for (J8) is 51.5%. The current rule of thumb from Scott Shell, principal of EHDD, is that a two story net-zero building can be powered by roof top PV panels or PV-to-floor area ratio of 50%. The energy usage of a building is not limited to the building's mechanical and lighting systems. A building's plug load or equipment load is a significant part of its electrical usage. Table J2 depicts the impact of plug loads on a Net-Zero Energy building. Model (J9) assumes a typical equipment load of 10 Watts per meter square or that of a medium density office7. The additional equipment increased energy usage not only for the electricity used for the equipment but also cooling for the heat generated for the equipment. The total energy used by the building increased by 50%. The overall PV Area to Floor Area Ratio for Net-Zero Building also increased from 51.5% to 78.1%. Designing a more efficient Net-Zero building requires the design team and the client to tackle electrical usage (lighting and equipment) more aggressively. In Model (J11), both the plug load and lighting load were reduced to 5 Watts per meter square (50% of baseline usage). 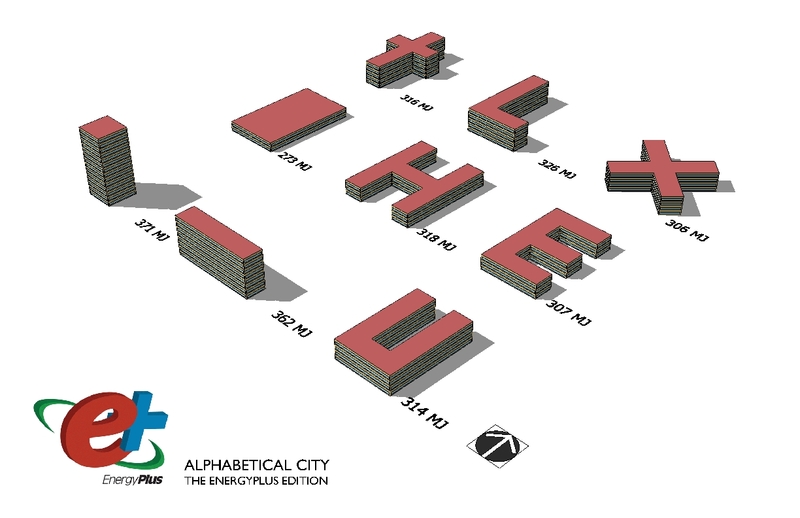 The resulting Net-Zero building has a PV Area to Floor Area Ratio of 57.6%. Above is a description of this author's attempt to demonstrate how a Net-Zero Energy building can be designed on paper using EnergyPlus and DiaLux. Unfortunately, modeling does not necessarily translate into actual building performance. The reader is encouraged to work closely with the client and the design team to rigorously track energy usage and explore innovative ways to save energy. Hopefully, the innovations of designers today will someday make Net-Zero Energy buildings routine in the future. 4 Holl, Steven, (1980), Pamphlet Architecture #5, The Alphabetical City, Princeton Architectural Press.